Changing Bits: Apache Lucene™ 5.0.0 is coming! Can you explain What is the difference of using CategoryPath and Using FacetField for feceted search? I have seen many examples where people use either CategoryPath and FacetField. CategoryPath was used in older releases; newer releases switched to FacetField. Thanks for the quick reply.. But It is not deprecated. I thought that CategoryPath is for Tree-like hierarchies and FacetField is for flat hierarchies. As of the 5.0 Lucene release, CategoryPath is replaced with the simpler FacetField, and FacetField does handle hierarchies. 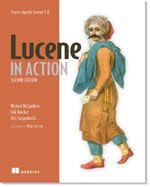 Is it possible to implement the same with lucene? Is there a Facets user guide for lucene 4.10.3 or lucene 5.0.0 ? The facets user guide is unfortunately way out of date. It looks like Shai did respond to your questions on the list? Can you use facet sampling? It does not work with ranges but does work with "ordinary" facets, so e.g. if you indexed the bucket ID here (unique bucket ID for each 5 minute period) then you could sample that?